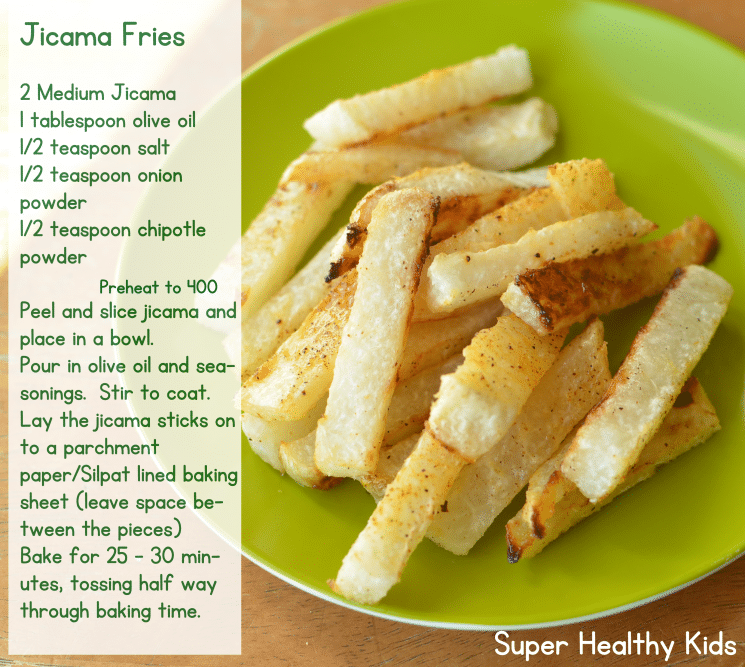 Jicama is a root vegetable that is high in fiber, vitamin C and low in calories. It is crunchy, mild and incredibly versatile. You can eat it raw or cooked. The great thing about eating it raw, is that you will have a snack ready in 2 minutes! 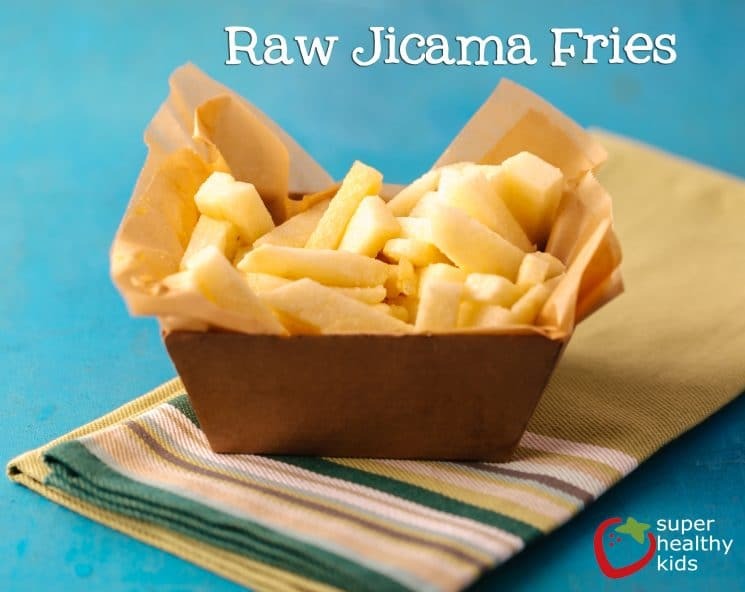 We are going to show you how to make Jicama Fries both cooked and raw! We love to eat jicama fries raw dipped in hummus or any type of bean dip. 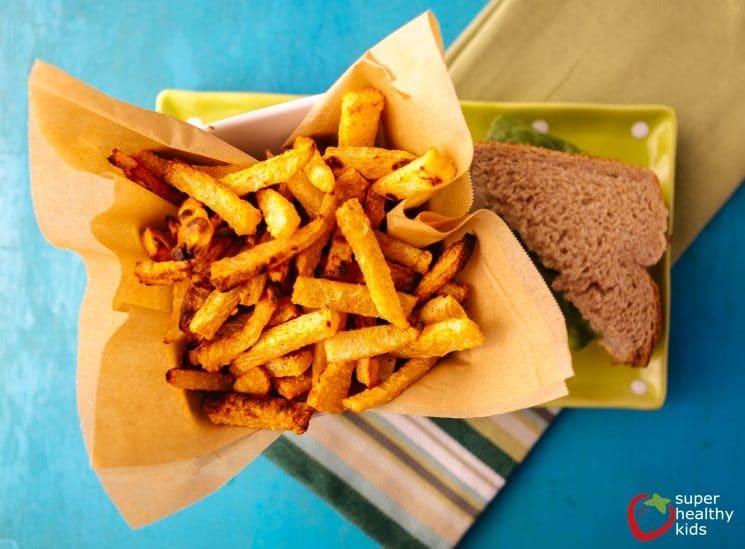 We love to eat cooked jicama fries dipped in ketchup or just plain! 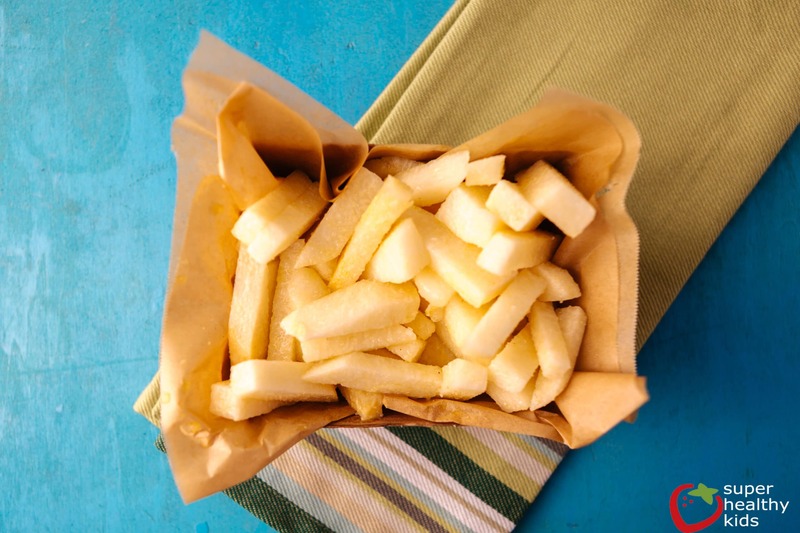 The hardest part to making these fries is cutting up the jicama. The peel is thick and difficult to remove if you don’t have a good peeler. 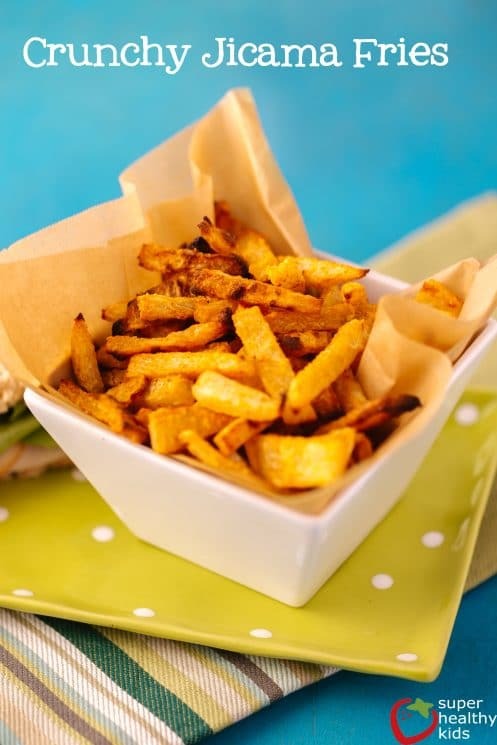 These are crunchy and delicious and make a yummy side dish to go with sandwiches, hamburgers, or salads. Raw jicama is a cross between a cucumber and a water chestnut as far as taste goes. They are super crunchy, with a very mild flavor. The smaller jicama are younger and sweeter. The larger ones are older and starchier – better for boiling and mashing than eating raw. So when you are choosing a jicama to eat raw, try to choose a smaller one. We love this snack because your kids can make it themselves! (Once it is peeled and cut) Jicama doesn’t turn brown or yellow like some other fruit and veggies – apples, potatoes, pears. It stays white and delicious looking so you can make these ahead of time without worrying about the color changing. Add 1/4-1/2 tsp. salt and 1/4 tsp. garlic powder. We think it is fun to make fry bags out of paper. This is a fun activity to do with your kids! The origami fry bag can be found here. 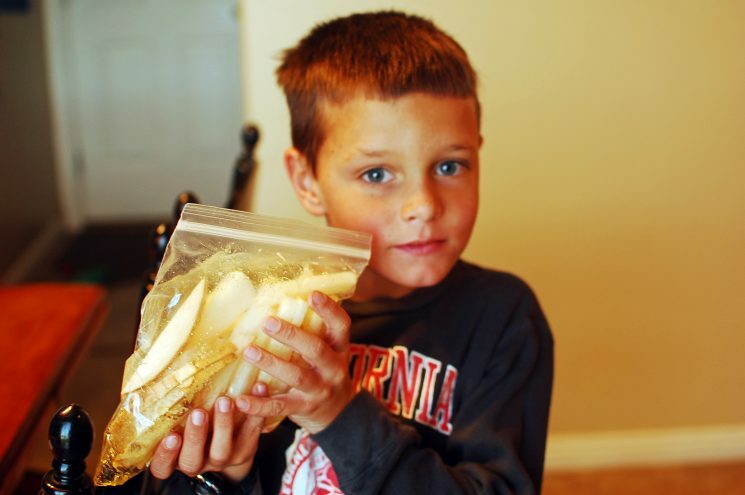 You can make little ones for smaller portions, or bigger ones for older kids. Try this yummy and simple snack with your kids – it is a great way to introduce a new veggie in a fun way! I just want to make sure I didn’t miss anything. Are these ever cooked? or do you eat it raw? Sweet! I need to try these again…the garlic and salt sound delicious…I have a friend that would also make them with cinnamon and other spices…thanks for sharing! Amanda, we haven’t tried them baked either. I do want to. Iva: Thanks for the details! Mary, we eat them raw. Ohhh! That sounds really good! Thanks for sharing Angie. Oh, I haven’t thought about buying jicama. This totally takes me back to living/teaching in Mexico. A lot of the kids at my school would bring jicama for a snack, but usually they had it sprinkled with a chili powder with lemon and salt. I love it Jenny! Thanks for sharing. 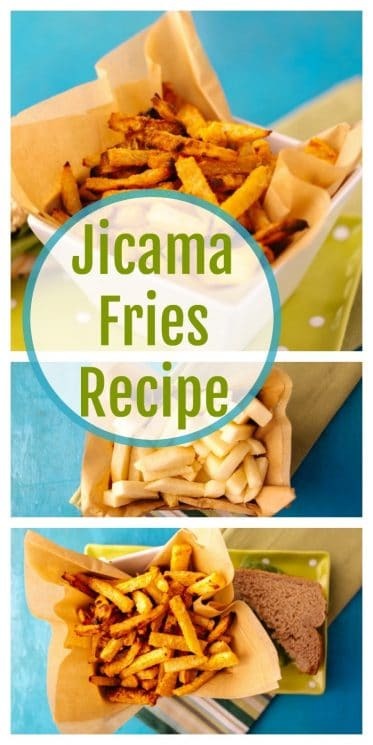 so fun- what kind of paper did you use for the ‘box’ that maybe doesn’t fall apart with juicy jicama in it? reusable, perhaps? 🙂 thanks for the inspiration- gotta try these!! i’m always on the lookout for fun, easy and delicious ideas for our family and particularly my three year old son! It was just craft paper- not reusable. I have always been unsure about trying jicama but after your explanation of the flavor I am buying some this weekend. I can’t wait for our family to try it! Thank you!